Finding lasting love is not an easy task! 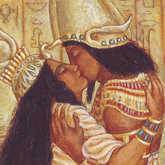 When it comes to romance, we here at Tarot.com know that you want more than just answers into your love life -- you want to be sure you'll find your other half. That's why we continue to provide you with the most direct, in-depth love insight we can. Our Soulmate Tarot Reading not only reveals your romance potential, but also offers guidance on creating the love connection you've been waiting for. Have you ever asked questions like: Is this person my soulmate? Will I meet the person I'm meant to be with? What can I do to make it happen? If so, this reading was designed for you. Believe it or not, you are the most important person in your world! The first card in this reading is your chance take a deeper look at your inner self at this moment in time. Before you can consider a relationship with your soulmate, you must first consider your relationship with yourself. This position in the spread is designed to give you insight into your feelings and motivations as you approach love. The love of your life is out there. This person could be on the couch next to you or oceans away, but he or she is bound to be revealed in time. The second card in this Tarot spread reveals how you view -- or will view -- someone you are involved with. This insight offers you a chance to dig into how you are perceiving this person and your connection. It's possible that the same questions have been rolling around in your head: What's holding me back? Are outside influences affecting my relationship? What is preventing me from finding true love? The Karma card shows the forces currently at play in your love life. This is an opportunity to clearly see the energies surrounding you and how they are impacting you. The road to romance is full of bumps and roadblocks. Your love potential will be challenged, whether it's internally or externally. The Thorns card offers guidance on overcoming the issues you -- or you and your sweetheart -- might face. There's always a chance to grow, both individually and together, to become a stronger team, and this card gives you the guidance to do that. Sometimes we need to zoom out and get a bird's-eye view of our current situation. The Divine card provides rich perspective on who you are and who you've been on your quest to find your soulmate. By revealing the bigger picture, you have a better understanding of the impact you are having on your love life. One of the hardest parts when searching for your soulmate is wondering when things will finally come together for you. The Destiny card provides insight into where you are headed in your pursuit of love, helping you see that your future is always taking shape, even if you aren't aware of it. Your love story is always being written, and the Magic card gives you a glimpse at the chapters that are still unfolding. These unknown factors could help our hurt you, making it crucial to identify them. Nothing in your love circumstance is set in stone, and this card helps you steer yourself in the right direction. 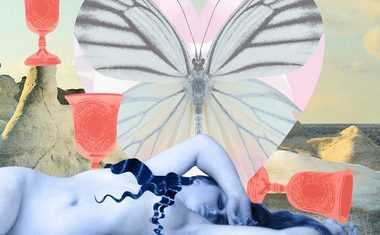 The last position in this love Tarot spread provides advice the Tarot wants you to follow. 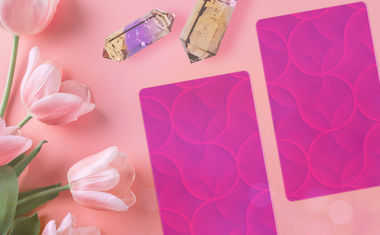 Whether you need clarity about your current situation, or are still searching for your special someone, the Kiss of Fate card gives you the steps to find and sustain a lasting connection. Finding infinite love may be tough, but it will always be worth it! Take control of your destiny by uncovering how you can find your other half NOW.